The largest of the original 18 diminutive houses built in 1926 by F.E. Carson and C.R. Hudson on Clark Street is a fine example of French “Chateaux” Eclectic architecture. Bertha Noble, the current owner, was attracted to one of the homes located on Normandie Court when she found the larger home on Clark Street. Originally from Sri Lanka she had lived in England for several years and had always been fond of cottages. The petite home was “an answer to her prayers” as she wanted to move into a smaller home that would bring back the feeling of the cottages in England. Written in the Daily Facts on August 2, 1926 “Normandie Court gives you a satisfied feeling, a sense that all is well with the world, the placidity of existence guaranteed now and for evermore.”An inviting courtyard at the entrance of the house has newly laid multi-colored brick tile and is bordered to the east with the entrance door. The front door is recessed out with a gable roof over it. To the south in the courtyard is a set of three French doors. Each door has a large central glass pane surrounded by elongated divided lights. To the west is a single similar French door. A short four-foot stucco wall provides privacy to the courtyard with a half circle formed in the center. This open courtyard helps shape the house into a “u” shape. Its steeply pitched crossed-gabled roof with no overhang, patterned exterior stucco walls, and small-hipped dormers create “The storybook effect”. The front picture window with a slight arch creates an effect similar to the French doors. It is flanked with two casement windows with similar divided light glass. To the west and east you can observe casement windows with the French door design and double hung windows. The chimney is stuccoed.Normandie Village was built with individual single car garages, was fully landscaped and could be rented furnished or unfurnished. 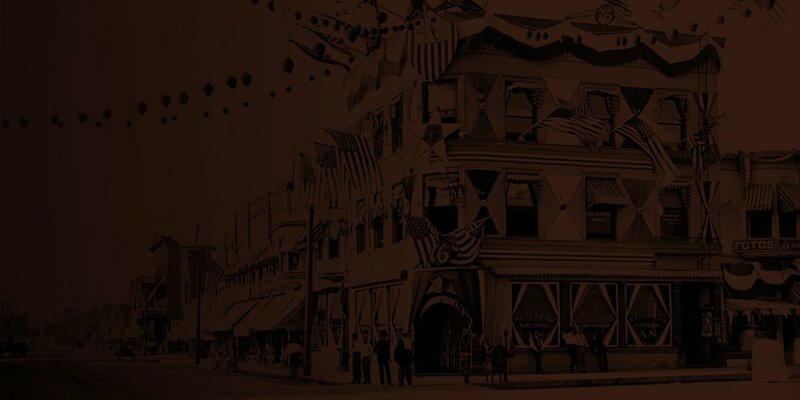 San Bernardino County Archives records indicate John Macdonald Ross as the first owner in 1926. Prior to 1943, when Doak and Beatrice Davis purchased the house, it was a rental. Past renters included Mr. & Mrs. Joseph Caldwell, a baker and Smart & Final Manager, and Mr. & Mrs. Paul Zylka, an interior decorator and owner of a drapery business. To date approximately half are owner occupied and half remain as rentals. Bertha Noble is proud of her home and the recent exterior four color paint scheme it proudly displays. She purchased the home in 1997. Since moving in she has had craftspeople install new awnings, built a deck in the rear yard, tiled the courtyard, and landscaped the rear and front yards. Her goal of providing the feeling of the “English cottage garden” has been achieved. 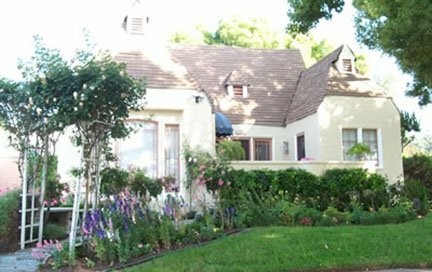 The array of flowers creates a colorful palette.The Redlands Area Historical Society shares its enthusiasm for this charming home.